Hitch waits for some love from the palace. When Alfred Hitchcock was designated a Knight of the British Realm toward the end of 1979, henceforth his formal title was Sir Alfred Hitchcock, KBE. His life was quickly winding down, but between bouts of depression and heavy drinking, the old jokester flashed forth. Parlaying the honor into a brief PR stunt for his never-to-be-completed film The Short Night, he rechristened himself The Short Knight. His longtime friend, Universal Studios heavy Lew Wasserman, quickly threw together a celebratory luncheon attended by old friends Cary Grant, Janet Leigh and others. British consul general Thomas W. Aston bestowed the medal. 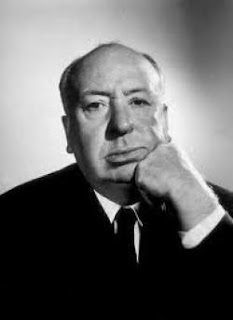 When a reporter asked him why it had taken the queen so long to bestow the honor, Hitchcock dryly replied, "I guess she forgot." Sadly, he was to enjoy the title for only another four months, whereupon he passed away. That may be the end of the story. But it isn't the beginning. As reported in the London Daily Mail today, the Queen first awarded Hitchcock in 1962, but he turned the honor down. As disclosed in a recent release of information from the royal archives, the director declined "because, in his view, it did not do justice to his contribution to British culture." Wow. That's ballsy. If I were to be invited into the Order of the British realm, I'd accept the offer without a second thought. Turns out, hundreds of artists, scientists and others have snubbed the queen -- usually for political reasons, or out of protest. But Hitch was different. In effect, he said, "Your highness, is this it?" That got me thinking. And Googling. Turns out that in 1962, Queen Elizabeth II offered Hitch the title "Commander of the British Empire." That title, while impressive, is of a lower rank than KBE. Most importantly, perhaps, it doesn't come with the honorific prefix "Sir." Thus, after fronting 48 movies and a hit TV show that rank among Great Britain's most important cultural exports, Hitch was still to be addressed as "Mister." That didn't sit too well with him. So he declined. I might not have been able to do what he did. But I can understand why the man who never won an Academy Award and who thus accepted the Irving Thalberg Lifetime Achievement Oscar with a two-word acceptance speech ("Thank you") marked his CBE medal "return to sender." He was holding out for something better. Too bad there isn't a British rank titled "Maestro." This is interesting on a historical level and on a personal one as well, because it shows an side to Hitch's personality and how he saw himself that many don't really consider or aren't even aware of. Interesting story. He was a bit self-involved, wasn't he? This is really interesting. I wish I knew him in person..he seems so fascinating and I love his movies. Glad I stumbled upon your blog, definitely following! It's interesting that at a time we in the U.S. considered Hitchcock primarily a Barnum & Bailey-esque showman and "the master of suspense," and when Queen Elizabeth offered merely the measly "Order of the British Realm," the French were touting him as a cinematic master and honoring him on a regular basis. What is it with the French?? I believe it is called "taste" and "sensibility" - something they seemed, at one time, to have possessed far more than other Western cultures.